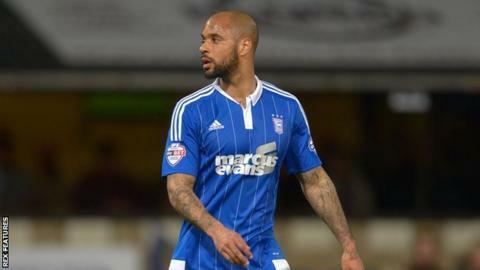 Ipswich Town forward David McGoldrick believes he is nearing full fitness having spent almost four months out with a hamstring problem. The 28-year-old Republic of Ireland international has scored three goals in 21 appearances this season for Town. "My hamstring feels fine, I've been training for four weeks now," McGoldrick told BBC Suffolk. "I've been sprinting and hopefully I'll keep on top of it in the gym, and keep doing the work I have to do." McGoldrick, who has scored 27 league goals in 88 appearances for Ipswich, made his return from injury late on against Wolves and came on with 25 minutes to go against Charlton. "It'll be good to score again," he continued. "The last one was a penalty against Brighton ages ago (in August). Before this injury I was out for a month with a groin injury so it's been a long time. "There's six games left now - I don't know how many minutes I'll get but I'd like to show some sort of form between now and the end of the season. "It would be nice to go out there and score some goals and get the fans singing my name."